Tankless water heaters have changed the face of home luxury. Their new and innovative designs enable you to get continuous running water and ensuring maximum energy efficiency. 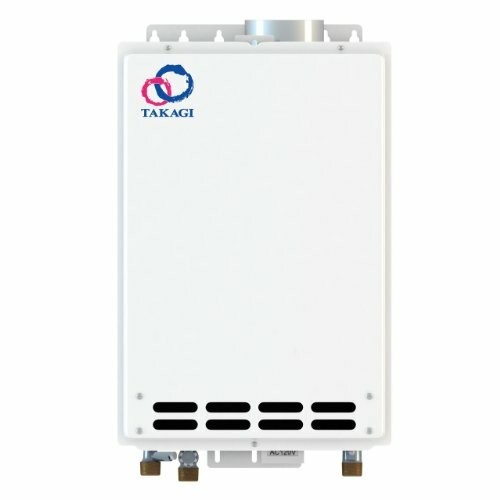 These tankless water heaters are available all over the market in many different sizes. However, the Whole House Water heaters are the most powerful units as they can assist you to heat tons of water from different appliances in the house. These units can help you save money, space, and energy. Their tankless design ensures you can use them anywhere you want and that they will last much longer. They have higher flow rates and can raise the temperature by a much higher amount. This is perfect for use in homes as there are many different appliances running at home such as sinks, showers, dishwasher etcetera. Below are my pics of the best Whole House tankless water heaters on the market today. 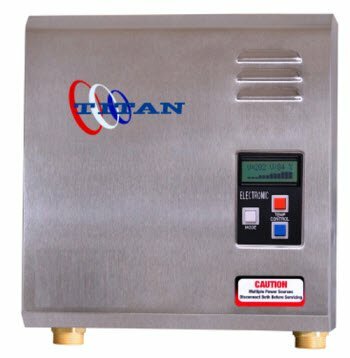 The Titan Tankless Whole house water heater is perfect for small homes as its flow rate is about 12 GPM. This means it can easily heat up 1 to 1.5 baths in colder climates and 2.5 baths in warmer climates. The Titan is designed to be efficient as well as space saving. Where conventional tank type heaters would take up to 20 cubic feet of space and weight about 100 lbs, the Titan merely takes up 0.29 cubic feet of space and weighs only 9.8 lbs. this is due to its tankless design. It simply heats water as the water passes through the unit. No more waiting for the water tank to heat up before you can use it and no more hot water running out! The Titan delivers 21 kW of power at 220V. It operates at 88 amperes and requires 2 double pole breakers at 50 amperes and 2 6/2 wire lines. The temperature control allows you independent control of the temperature regardless of the flow rate. The tankless design also ensures easier installation and setup. You do not have to go to a professional to have it fixed up. The outer steel and the inner copper-brass casing ensures durability and corrosion resistance. The best is that the unit carries 10 years of warranty, which means you can use this device endlessly without fearing poor workmanship. All in all, the unit is about 99.5% efficient while it saves up to 60% energy. It is sure to reduce your heating bill by a significant amount. 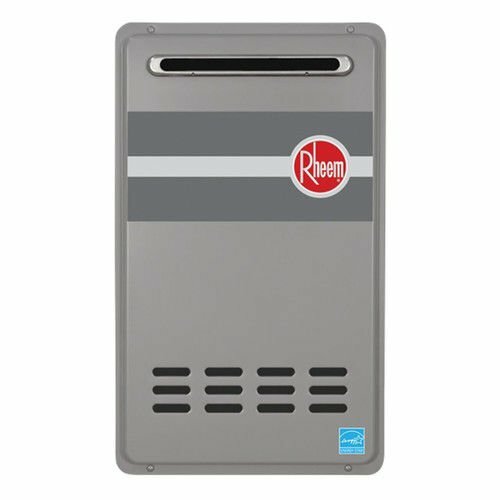 The Rheem tankless water heater is an exceptional whole house water heater powered by propane designed with high efficiencies of about 0.93 UEF. This is due to the efficient stainless steel condensing heat exchanger that ensures proper heating of the water without any of the heat being lost. The unit can help homeowners save up to 1100 gallons of water per year. It does so by decreasing the flow rate of the water to ensure water through the pipes is heated properly. It has a minimum flow rate of about 0.26 GPM and a minimum activation flow of 0.4 GPM. This ensures users can easily receive hot water in cases that demand low water rates. The tankless design heats water up as it passes through the pipes and the unit remains in ready to fire state for continuous heating. Installation of the Rheem unit is easy. It features a ½ inches gas line and a built-in condensate neutralizer. Also featured is a self-diagnostic system that ensures easier setup. No venting is required for the outdoor models and the unit can work in high altitudes as well. A digital remote control is included as well to help you control the temperatures according to your preferences. The Rheem Heater can connect to the Econet mobile app. This app allows you to combine multiple heaters to operate as a single unit. 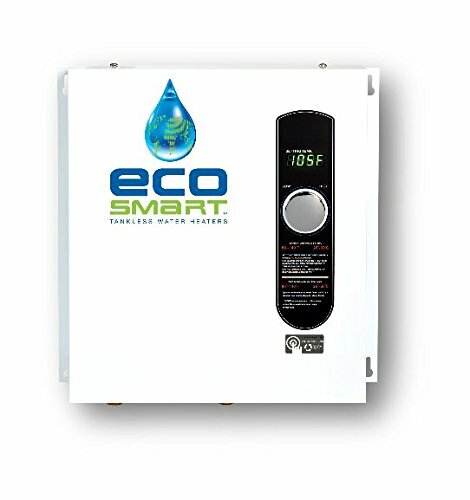 The overheat film wrap prevents the unit from reaching dangerously high temperatures as well as freeze protection up to -30 degrees F.
The Thermoflow Electric Tankless Water Heater is yet another innovative whole house water heater that features various technologies to ensure more efficient water heating. It allows you to save up to 50% in heating cost and uses 85-90% less energy than any other conventional storage heater. The best part is that this is a tankless heater. This means it does not require a large tank to store water and heat it up. Instead, it heats up the water as it passes through the pipe in the unit. This allows you to save a lot of space that would have otherwise been taken up by the tank. You can easily install it anywhere you like without worrying about the space. The activation flow measures about 0.6 Gallons Per Minute. The Thermoflow features a self-modulating technology that uses up only the amount of energy required. This makes the machine more efficient and reduces cost by a large margin. Also featured is a backlit LCD screen that allows you to select the temperature in one degree increments. You can easily set the temperature from 32 degrees to 165 degrees F. Since this is an electric model, it vents no gases or harmful substances. The machine operates at 240 V and delivers about 24 kW of power which is then used in heating up water. The nominal pressure of the unit is 90 psi and the current is about 100 amperes. It requires 2 60 amperes double pole breakers as well as 2 8awg wires. All in all, the sleek and stylish design as well as the improved efficiency makes this one of the best units to have. The Aquah Indoor unit utilizes natural gas as fuel to heat up the water. The tankless design saves space, energy,and cost. It also runs longer than the traditional tank-type heaters. This is because tanks are more susceptible to rust, leaks,and damages. The tankless design saves time as well, you do not have to wait around for the water to heat up before using it. Additionally, you can spend as much water as you need because the warm water will not run out. This is because the Aquah heats up the water as it passes through the pipes. The Aquah features a flow rate of 4.23 gallons per minute which is perfect for apartments and small houses with 2 baths. It features an automatic electrical pulse ignition with no standing pilot. You need two 2DC batteries or by connecting to a 120V power source for maximum performance. The gas unit ensures 85% thermal efficiency, utilizing all heat from the fuel in heating the water. The unit can easily raise 45 degrees F at a flow rate of 4.23 GPM. It utilizes 25 to 110 water pressure and a gas pressure of 2000 Pa for efficient operation. The pipe for the water is ½ inches and for the gas is ½ inches as well. 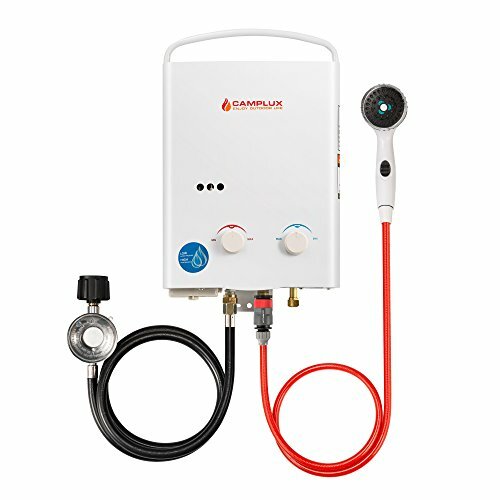 The unit allows you to control the flow of water as well as gas granting you ultimate control over the heating process.The machine is bigger and heavier than other tankless types, weighing about 30.2 lbs and measuring about 27 x 16 ½ x 8 inches. The Bosch is an acclaimed brand, renowned for manufacturing quality home products. Like all other Bosch products, The Tronic water neater does not compromise on quality either. It can easily deliver a maximum of 3.3 GPM at a 55-degree temperature rise as well as 2.4 GPM at 75 degrees of temperature time. This means it can easily provide endless hot water for 2-3 showers as well as sinks. 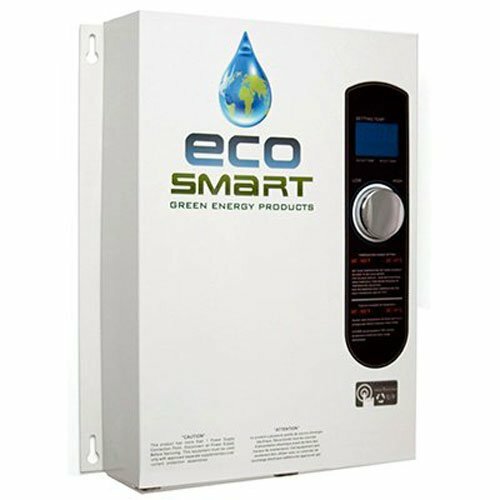 The tankless design ensures the machine does not take up much space and it is 97% efficient with minimal standby loss. The stand by loss is more evident in tank type heaters where you must wait for the water to heat up everytime. However, with a tankless unit, a built-in flow sensor ensures a constant temperature output. Also featured is element modulation that ensures a constant output temperature. It does so by using only the amount of energy required to heat the water to the specified temperature. The unit features an improved temperature control as well and the temperature control allows you to set the temperature according to your preference. It delivers a power of 26.85 kW with the activation flow being 0.8 GPM. The water pressure range for operating the machine is 15-150 psi. The device is durable and comes with a filter on the inlet pipe which prevents any harmful solid substances from damaging the device and helps in scale resistance. This device is perfect for smaller homes as well as office suites, garage apartments, studio apartments and in-law suites. 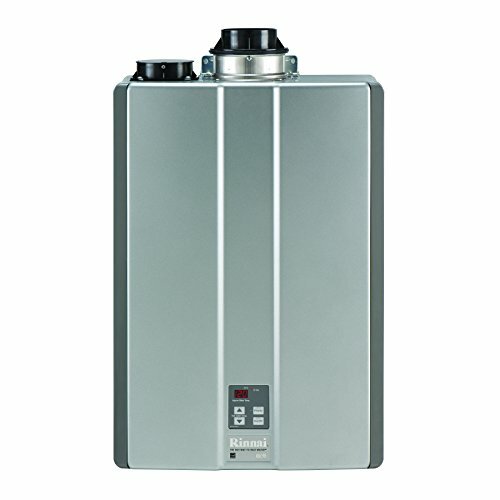 This Aquah Indoor Liquid Propane tankless water heater is similar to the one mentioned above. The only difference is that it is operated using propane liquid instead of natural gas. Its tankless design is perfect for saving space and cutting costs. These units are much more durable than the tank types as there is no tank present that will rust away. Instead, the water is directly heated as it passes through the unit. This ensures maximum efficiency as no standby losses occur. The Aquah has a flow rate of 4.23 gallons/ minute which is sufficient for heating water for small apartments. It utilizes 2 DC batteries or a 120 V electric power source to help in the automatic electrical pulse ignition. This unit ensures about 85% thermal efficiency which means that all water is heated properly. It can easily raise 45 degrees F at 4.23 GPM and you can easily control the amount of water and gas passing through the unit. The machine uses 25 to 110 water pressure and a gas pressure of 2000 Pa which ensures a much more efficient operation. Furthermore, this unit is a bit bulky so it is recommended that you measure the place you want to set it on to ensure it fits perfectly in. Another reliable model from Rheem, this water heater uses natural gas for fuel. It utilizes condensing technology that allows gas to be recycled and reused instead of being exhausted. The heated gas is passed through the water where it loses its heat. It is then heated back up to ensure efficient operation. This unit helps homeowners to save more than 1100 gallons of water in a year. The minimum flow rate it can handle is about 0.26 GPM and the activation flow counts for about 0.4 GPM. The unit further features easy installation as well as a self-diagnostic system to help you set it up. Also included is a digital remote control that helps you set the temperature according to your preferences. This remote control can easily connect to the Econet Mobile app where you can combine multiple units to act as a single unit for the whole house. The overheat film wrap prevents the unit from reaching dangerously high temperatures as well as a freeze protection up to -30 degrees. Also featured is a ½ inch gas line and a built-in condensate neutralizer. The Rheem Model is perfect for outdoor uses as well and can be used in higher altitudes. 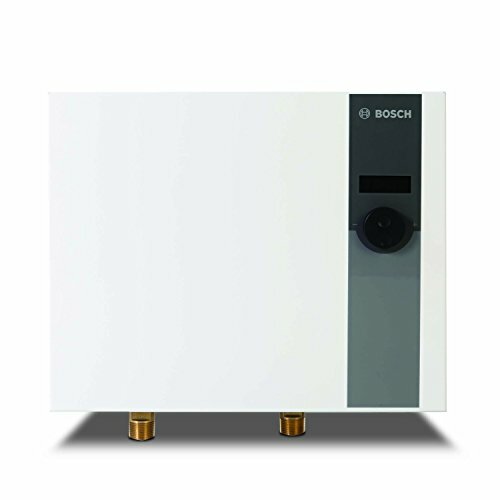 Here is another quality product from Bosch, this 17.3 kW tankless water heater is perfect for use all around the house. It can be installed virtually anywhere and heats sufficient water. It can be used to raise the temperature by about 75 degrees F at 1.6 GPM and 45 degrees F at 2.3 GPM. This is sufficient to power a single bathroom with a sink and a shower. A typical tank type heater might require 9 feet of space or more, however, the Tronic tankless model is much more compact. It is easier to set up and can be installed without professional help and willprovide you with constant flow of warm water for as long as needed. That way, you do not have to worry about running out of hot water. The Bosch is constructed of polymer encased elements and a built-in flow sensor. The built-in flow sensor adjusts the temperature according to the temperature to ensure a constant temperature output. Also included is an external temperature control knob that you can use to adjust the temperature at your desired amount. Thisheater is extremely efficient, having about 97% of thermal efficiency. The Bosch heaters uses a high technology flow transducer to operate with robust polymer wrapped elements that ensures top durability. Since there is no tank involved, there will be no corrosion or leakages and the unit will last you more than 20 years. Also included is a 5-year warranty to help prolong the life of the unit. The Stiebel Eltron Tempra electric water heater features advanced technology that allows you to save money as well as energy. This unit is extremely energy efficient and uses 25% less energy than a tank type. Therefore, you do not have to worry about standby losses which are common in tank type heaters. With the StiebelEltronTempra, the water gets heated as it passes through the unit. Therefore, storing the water is not needed anymore so it minimizes all standby losses as mentioned above. Moreover, its brilliant tankless design also results in a continuous flow of water and it does not need to be vented outside. Also featured is a patented Tempra advanced flow control where the unit automatically reduces the flow rate to maintain the desired output temperature. The flow rate is only slightly changed. Also included is a smart processor technology that ensures a steady output temperature by varying the flow rates. It also helps in reducing waste and saving space. These units are easier to install and do not require professional help to set up. If you know a bit about plumbing, you can easily do so yourself. The tankless system is not subject to seismic building code either, so no preventative construction is required. To prevent the danger of scalding, the Tempra has a set maximum limit of the hot temperature at 109 degrees F. It delivers 19.2 kW and features an activation flow of 0.5 GPM. What to Consider When Buying a Whole House Tankless Water Heater? When it comes to buying tankless water heaters for the whole house, you might end up getting confused due to the wide variety of models present in the market. These models each have different specifications such as power rating and flow rate which serve you in different ways. The very first thing to consider should be which type of heater you want to choose. For small houses, I recommend you to go for the electric type heaters as they are less costly and are a bit more reliable. It is easier to use them and they last much longer. There are fewer maintenance issues and you do not have to worry about the fuel. No gas pipes or vents are involved either. So, choose these for apartments or houses with less venting facilities. On the other hand, if you are looking for heaters with greater efficiency and power, the gas type will serve you much better. For larger houses, you can buy some of the environmentally friendly tankless heaters. They produce higher flowrates as well, so you can use them across a wider variety of appliances. If you choose to go for the gas type, there are two options for fuels: Natural gas and Propane. There is not much difference between propane and natural gas so your best option in this case is to consider getting the cheaper one and the one which is more readily available in the market. When it comes to large houses or even small ones, the maximum flow rate of the heater plays a large role. Maximum flow rate determines how many showers and sinks you can run on it. For small houses with just one bathroom and a kitchen sink, I recommend a 2- 2.5 GPM heater as this is enough to provide hot water sufficiently for the entire house. While for larger houses, nothing less than 4GPM will suffice. Then you must calculate your average water flow rate and ensure your product meets these specifications. When various individuals are using the heated water from the same heater, it is essential that each of them can control it according to their preferences. There are some heaters that are flow controlled, i.e. their temperature changes with the flow rate. These could result in cold water if you opened the taps too much. So, it is essential that the heater provides you with some sort of control over the temperature. Next, the temperature rise should be considered as well. Some heaters provide a greater temperature rise at the same flowrate while others provide a lower one. Gas powered ones are capable of more temperature rise. The incoming water temperature plays a huge role here as well. For mild and warm climates, we recommend the electric heaters as they can easily power the whole house and do not require you to raise the temperature by much. However, if your house is in an area with significantly colder climates, consider a gas type heater as they can easily heat up the whole house from lower temperatures. Most materials tend to build up the lime scale and usually require proper maintenance. However, there are many infrared technologies that help eliminate scale and require far less maintenance. So, we recommend you opt for these units. These heaters are much more efficient than their tank counterparts in heating water for the whole house. As they heat the water as it passes through them, there are fewer standby losses. The energy is not wasted by trying to keep the water in a tank at a constant temperature. Since they use less energy, they can easily run huge households at affordable prices. The price is also reduced due to the fact that there is no tank and virtually no maintenance involves. Because there is no tank involved, these units take up less space. You can easily install them under a cabinet or in your bathrooms. Even the largest of units measure around the size of a suitcase. The water gets heated as it is passed through the unit. This means you do not have to wait for the water to be heated up, neither do you have to fear running out of hot water. This is one of the main attractions in using a tankless water heater for the whole house. You can easily control the temperature of the water around the whole house with a single unit. No need to mess around with controls. Instead just dial it up till whatever temperature you like, and the whole house can enjoy hot running water. Their performance might be affected if the water is seriously ice cold. This can be a problem in colder areas where you might have to raise the temperature by a significant amount. The gas heaters can help in such cases, however, even they can fail when it comes to power the whole house. Because they power the entire house, this might result in a lot of water being heated. This reduces the flow rates of the water. So, you might end up with perfectly heated up water many benefits to using a tankless water heater for the whole house, it still presents some disadvantages. This technology reads incoming water temperature and adjusts the energy output accordingly. This means only the required amount of energy is utilized while the water tap temperature is kept constant and steady. Flow Control is the technology which allows you to keep the temperature constant by dropping the flow rates slightly. This happens when you run a large volume of water through the unit that it cannot handle heating properly. Most gas powered heaters utilize this condensing technology. This ensures the hot gas is not vented out, instead, it is recaptured and returned to the water. There it gets cooled and is used again for heating water. These tankless heaters have a much more compact and sleek design. They can be easily installed under the sink or cabinets. The best part is that you can easily heat up water for the whole house without needing to vent gases outdoors. This makes them a viable option for apartments and smaller houses. They are less prone to scaling and have a longer life generally. The fuel-powered heaters normally run on natural gas or propane. They are much more efficient in heating water and they result in a much more temperature rise. They have higher flow rates as well. This ensures they can be used for larger households. However, their main disadvantage is that they produce harmful emissions that need to be vented out. So, there you have it. Tankless water heaters can be very beneficial for your home and your family as they can help to reduce the cost, space and use energy more efficiently. All in all, these units allow you to keep high flowrates while keeping the temperature constant and you will be extremely happy with how consistent performance these tankless water heaters deliver. Hopefully, you will have all the information you need to make an informed decision. Whole house tankless water heaters are extremely durable and are known to deliver top-notch performance every time you need warm water.